You get what you pay for. Buy cheap, buy twice. I’ve heard them all before. But a couple of my old-but-useful Linux PCs needed an upgrade to high speed USB recently, and I didn’t want to spend much. A quick search on allegro.pl (the Polish equivalent of eBay) turned up just what I was looking for. 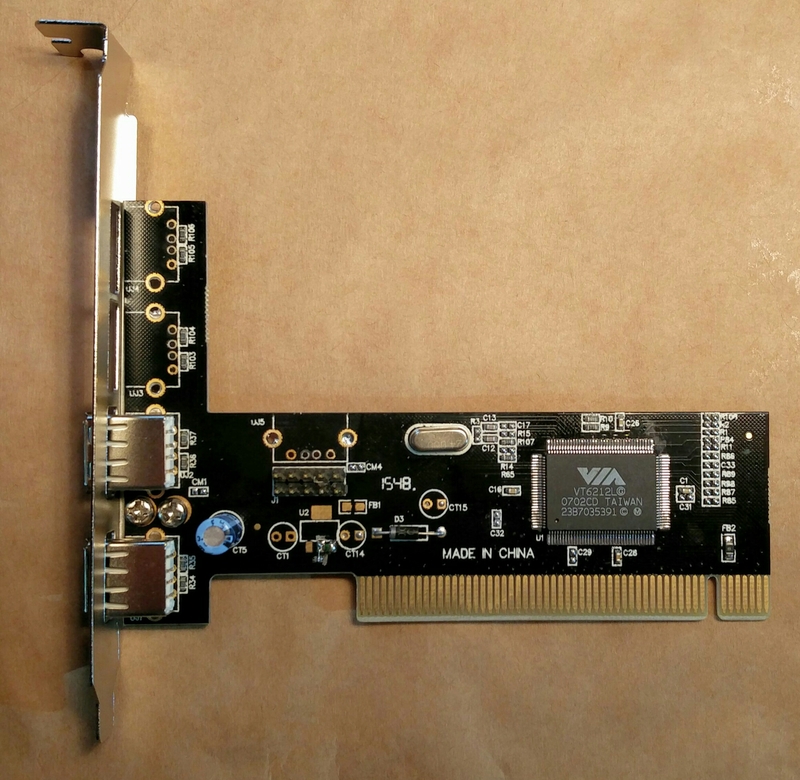 USB 2.0 adapter cards to fit the now-retro PCI bus, for just 20 złoty, or a bit less than four quid in old money. “Five USB 2.0 ports”, exclaimed the advert, in Polish. “Four external and one internal”. Perfect – I wanted to connect an internal card reader so the internal port was just the ticket. The cards arrived this afternoon and I examined them. What do you get for four quid? A generic Chinese box and the card in an anti-static bag. No instructions or other such luxuries. 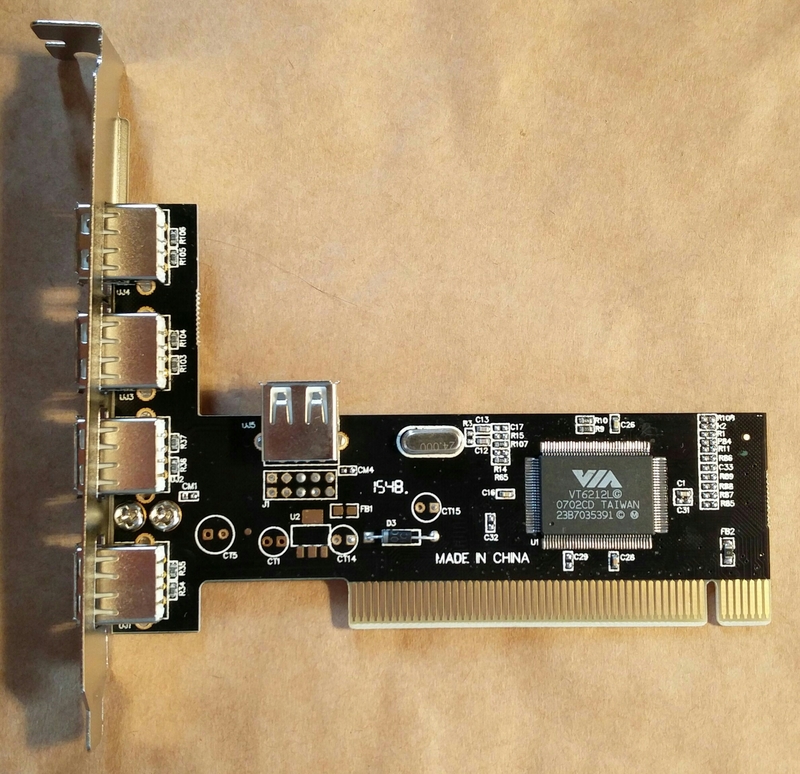 There’s just one chip on the card: a Via VT6212L. Wanting to know what I’d got, I looked it up. It’s still listed on the legacy section of Via’s website. The specification there, though, shows that it’s a 4-port USB controller. So how had my card got 5 ports? A close look at the PCB tracks on the card reveals all. The internal USB port is wired in parallel with the topmost external port, so you can’t use both at once. Looking more closely, there’s a footprint for a 10-pin Molex header which would be ideal for my internal card reader, but it’s not fitted. Examining the tracks round the header, it turns out that the two USB ports it provides are connected in parallel with the top two external sockets. If you want to use the header, those two external sockets are no use! Oh well. I can live with 4 ports, and remove or ignore the ones that won’t work. But there’s another design “feature” that came to light while I was examining how the sockets were wired up. One of the functions of a USB port is to supply power to the device that’s connected. That’s very useful. Last time I designed anything with USB host ports on it for public use, it was important to make sure that power was monitored and limited so that a misbehaving device or damaged cable can’t affect other devices or, worse, cause overheating. All this is written into the USB specification and there are handy chips available to make it easy to implement. But they cost money. Examining this board, it became clear that the designers took no such precautions. 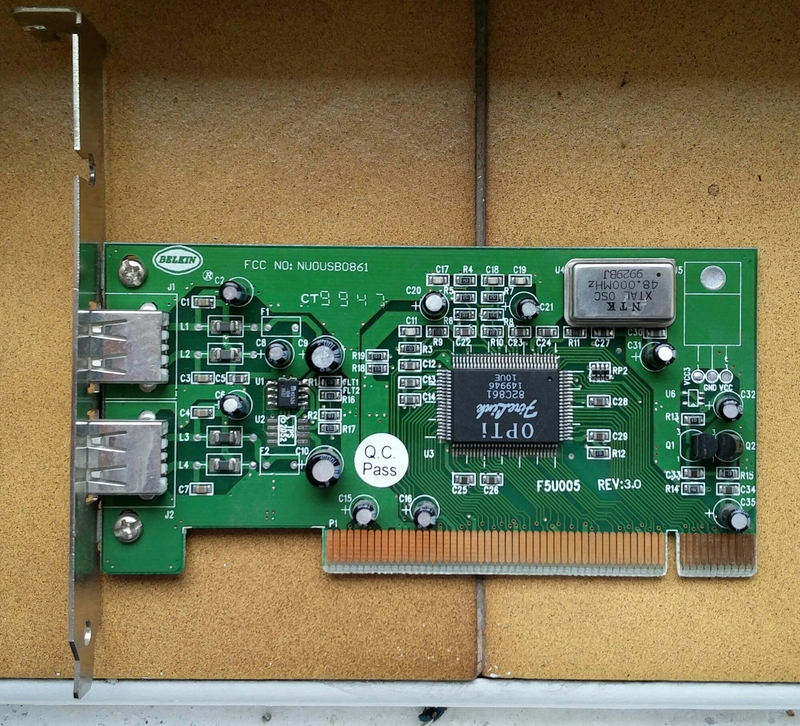 The 5 volt power comes straight from the PCI bus to the USB connectors without so much as a fuse, or even a decoupling capacitor. Any mishap on a USB connector can therefore receive the full force of the PC’s power supply, which can be tens of amps. Yay! A short circuit will at least crash the PC, or even result in melted cables and scorched PCB tracks. Splash out on a few microfarads of decoupling capacitor fitted to the place marked out on the PCB but kindly left free. Here’s a picture of the results. The board is now in service and working nicely. Incidentally, I have just retired an old USB1.1 board which shows how it used to be done ‘properly’, in the days when anyone cared about these things. Note the little 8-pin chip on the left hand side. That’s the one responsible for switching and protecting the power output to the USB sockets. The one fitted is a Micrel M2526, but there’s also space for a Texas TPS2052 which does the same job. Belt and braces! This entry was posted in Uncategorized on September 20, 2016 by martinjonestechnology. In a previous post I resurrected an Atari ‘Super Breakout’ PCB from 1978. One of the rules of my collection of arcade game boards is that they should all be playable, if they’re working. To that end I try to construct adapters to make the games all compatible with the JAMMA wiring standard, so I can just plug them in to my gaming setup and enjoy them. Usually it’s just a matter of wiring: most game PCBs after about 1980 use similar power and control signals to the later JAMMA standard, but differently wired, so no electronics are needed. Plug time: the Deluxe Arcade JAMMA fingerboard is really handy for making adapters, and I sell them. They’re great value. Buy lots and give them to all your friends. Super Breakout isn’t such an easy case, though. About the only things which can be wired directly to a modern arcade setup are the coin contacts and start button. Everything else is unusual, starting with the power supplies. JAMMA wiring provides +5V for powering the main logic, +12V which is usually used by the audio power amplifier, and -5V which is also used on some boards by the sound generation circuitry. Super Breakout’s power input circuitry looks like this. The circuit appears to expect +10V DC, and a pair of centre-tapped AC supplies, one of 16.5V AC and one of 25V AC. The end result of it all is supplies annoyingly similar to the JAMMA standard: +5V, +12V and -5V, with an extra +20V for the audio power amplifier. I could, of course, just modify the board so that those supplies come straight from the JAMMA wiring, but that would violate another of my rules: no modifications to the original PCBs. Any conversions or adaptations must be done so that the original board, unmodified, can plug into my adapter and thence into a JAMMA connector. Looking more closely at the circuit diagram, the situation isn’t as bad as it looks. The +10VDC just feeds the input to a regulator which generates the +5V, so it just needs to be a DC voltage large enough to allow the LM323 regulator to do its job. With a regulator this old, this ‘dropout voltage’ is about 3V, so anything from 8V DC upwards should be fine. The lower we can keep this voltage, the less power the regulator will have to dissipate as heat, so the game will run cooler. That’s got to be a good thing. The 16.5V AC turns out to be used just to power the -5V regulator, so any negative DC voltage greater than about -8V (again allowing for the dropout voltage) will be OK. It doesn’t need to be AC at all. The 25V AC input is simply used to generate the +20V and +12V supplies, so it also doesn’t need to be AC. +20V DC will do fine. Having figured this lot out, the power supply problem is much less daunting. Converting the +5V and +12V from JAMMA to +8V, +20V and -8V is perfectly manageable. Various power supply modules are available at low cost from far-eastern suppliers on eBay, including the very popular 150W boost converter module. One of those is just right for converting +5V up to +8V, and a smaller off-the-shelf module can convert +12V up to +20V. Incidentally, though it would seem easier to convert +12V down to +8V, I chose not to do this: the +8V supply to Super Breakout needs to be able to deliver several amps to power all the logic, and the +12V JAMMA supply isn’t rated to handle that sort of load. JAMMA power supplies assume that the lion’s share of the load is on the +5V rail, so that’s where I’ve put it. Deriving -8V is a bit more tricky. The commonly-available boost converter modules only handle positive voltages, and I can’t play any funny tricks with ground because the +8V and +20V supplies need to share ground with -8V. The answer is a Ćuk converter. A few components hooked on to the switch output of the +20V boost converter can deliver a negative voltage. It’s not regulated, and will depend somewhat on how hard the +20V boost converter is working, but it’s good enough to feed the -5V regulator on the Super Breakout board. Below is a picture of the arrangement. The components inside the dotted pencil outline are on the off-the-shelf boost converter (of the ‘LM2577‘ type commonly available on eBay). and in real life, it all fits together quite neatly. The 5V-to-8V boost converter is the large red board at the top. The 12V-to-20V boost converter is the blue board at bottom right, and the components for the Ćuk converter are on the matrix board at bottom left. Note the red wire taking the signal from pin 4 of the LM2577 chip to feed the converter. Game on! This entry was posted in Uncategorized on September 17, 2016 by martinjonestechnology.